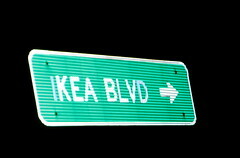 Sunday night on my way home from Papa & Gigi’s house I drove by the new IKEA. I took a couple of pictures, but didn’t get too close. It was cold and rainy and there were cones up everywhere. Tonight CSP & I drove by again after running a bunch of errands. There was a lady standing by the stoplight, wrapped up in a scarf, hat and mittens against the cold. I rolled down my window and asked if we could drive in to get some pictures. She said her job was to stand out there and tell people that the store wasn’t open yet. She told me I could go on in and “get to snappin!” There were 3 other people in the parking lot directing us with orange flags. Then we came upon a man with a flag who stopped us. As I pulled away from him we could hear him laughing at us. Crazy people taking pictures of a furniture store. 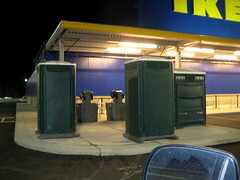 IKEA had set up porta johns for the campers. And patio heaters! Here are the campers. 3 tents, 5 campers. 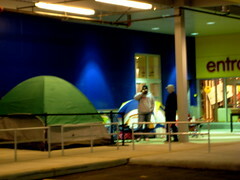 IKEA (I’m assuming) had a table out for them with coffee and snacks! And there was music! And lots of people milling about. It seemed like a pretty safe situation. But COLD. Like 40 degrees already and it was only 8pm. Too cold to camp out for a Poang chair! 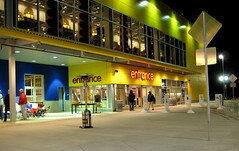 I rode by it last Saturday and was absolutely giddy to see that blue and yellow! I’m making out a shopping list. i totally thought you’d be first in line, lol! i’m already planning a trip over there in the next month or so. i’m sure you will have been by then and given us a review. So this store isn’t open yet, but there are people milling around? What on earth for?? When is the store opening? POÄNG chairs are pretty cool, though. We’ve got two! when does it open? this weekend? thats so funny! are you gonna get up and go to the grand opening?? I have one poang chair, too! I got the one in white leather, looks sooo nice and its super comfy! 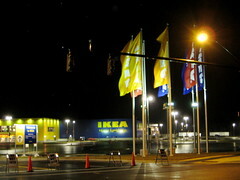 When ikea opened here, there were huge lines (and campers) for the first 2 months or so. Imposible to go. Our car got towed away the first time we went because we parked in the shopping center across the street. We didn’t know they had rented a parking lot around the next block and they had trolleys to bring people parking there to the store. 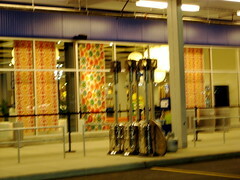 I brought 3 vases for $ 7 and then had to pay $ 250 to get the car : ( oh and the food in the store is great and super cheap! !